Basic Attention Token (BAT) has risen by a further 7% over the past 24 hours of trading, bringing the price of the coin up to around $0.37. The cryptocurrency has had an impressive run during April and the rest of 2019: an increase of almost 100% over the past 30 days and a further impressive 200% over the past 90 days. BAT is currently placed as the 22nd place in the top cryptocurrencies by market cap value as it currently holds a $463 million market cap. The unique browser is currently trading at a value 57% lower than its all-time high price. Against the USD, we can see that the market has had a remarkable recovery during 2019, as a part of the Altcoin Season. The coin had managed to break above the 100 days moving average during February 2019 and has been surging ever since. BNB/USD has now climbed above the November highest at $0.34 and has recently met resistance at $0.3815 where lies a 1.272 Fibonacci Extension level. From above: The nearest level of resistance above $0.39 lies between $0.3950 and $0.40. Further resistance above can then be expected at $0.4125 and $0.4313. Before reaching the July 2018 high at $0.4499, and at $0.4571 where lies the 1.618 Fibonacci Extension level. From below: Initial support now lies at $0.36, $0.34 and 0.32$. Further support can then be found at $0.30 and $0.2784. The trading volume has started to show signs of increasing over the past few days which is a good sign for the bullish momentum. The RSI indicates that the bulls have managed to remain in control of the momentum which is steadily increasing toward the bullish favor. BAT has also been creating fresh highs against BTC during 2019: The coin had broken above the 100-days moving average line during the end of February and has recently surged into resistance at 7114 SAT where lies a 1.272 Fibonacci Extension level. From above: If the buyers break above 7114 SAT, initial resistance lies at 7660 SAT along with the 1.414 Fibonacci Extension level. Above lies resistance at 8000 SAT, and 8500 SAT along with the 1.618 Fibonacci Extension level. From below: The nearest level of support lies at 6772 SAT. Beneath this, further support is expected at 6422 SAT and 6000 SAT. Below, further support lies at 5662 SAT and 5172 SAT. The trading volume has also spiked higher recently during the bullish surge. The RSI has broken back above the 50 level as the bulls resume control of the momentum. However, the Stochastic RSI is about to cross over at the overbought area. The post BAT Records Decent 90% Monthly Gains. What’s Next? Basic Attention Token Price Analysis appeared first on CryptoPotato. Yesterday, April 18th, Binance officially announced the launch of the mainnet of their decentralized exchange (DEX) called Binance Chain. The leading exchange also announced the first project to be featured on it – Mithril. In return, the price of MITH has skyrocketed upwards of 70 percent following the announcement. The long-awaited mainnet of the decentralized exchange Binance Chain has launched, according to an official announcement. According to the above press, the next steps include the migration of the currently existing ERC20-based BNB tokens to the new Binance Chain BNB (BEP2 BNB). The process is expected to take place on April 23rd, if everything goes to plan. Binance will facilitate the migration by allowing users to provide Binance Chain addresses where they will be able to withdraw their ERC-20 BNB tokens. The withdrawal itself is going to act as a swap mechanism. However, the first batch of 5 million BNB will be allocated and then deposited into addresses that belong to Binance in order to convert ERC-20-based BNB for the current owners. The same amount of ERC20 BNB will be burned in order to maintain the supply. Throughout the migration process, as more people convert to BEP2 BNB, Binance will be burning the respective amount of ERC20 BNB in order to keep the supply constant. Following up on the announcement, Binance revealed that the very first project to migrate its tokens to Binance Chain will be Mithril. According to the official blog post, the process will enable users to experience the DEX’s speed, security, and user-friendliness. By migrating to the Binance Chain, MITH token holders will be the first to experience the speed, security, and user-friendliness on the new Binance DEX platform while maintaining full control over their own funds. Migration of MITH from ERC20 to BEP2 will begin shortly after the mainnet launch of Binance Chain on April 18, 2019. The effect was felt immediately, as MITH surged 70 percent following the announcement. This goes to show the effect that Binance has on the cryptocurrency community, as well as on the market, in general. The post Mithril (MITH) Spikes 70% Following Binance DEX Mainnet Announcement appeared first on CryptoPotato. Canadian licensed cannabis producer Aurora Cannabis announced on Thursday that it has received approval from the German Federal Institute for Drugs and Medical Devices (BfArM). With this approval, Aurora Cannabis is not free to commence the construction of an indoor cannabis production facility in Germany. He went on to say that leveraging the broad competencies of Aurora Europe’s team of architects, engineers, pharmacists, plant specialists, and project management professionals will help the company establish a strong foothold in the European legal Cannabis market in the next couple of years. The management has previously said in a press release that the state-of-the-art Cannabis cultivation facility will be situated in Leuna, Germany and the construction process will likely commence in May 2019. “Construction of this new facility in Leuna is the next logical step in expanding our Europe-wide production network to ensure medical patients,” added Dr. Gille. Aurora Cannabis management said in a press release that it will probably take a year to complete the construction of the new Cannabis cultivation facility. Analysts are expecting that by October 2020, the company will be able to start shipping locally grown cannabis to the German medical marijuana market. Initially, Aurora Cannabis received approval to produce 4,000 kg of medical marijuana over the next four-year period. However, sources close to the company said the cultivation license will be expanded over time, depending on how the German regulators allow the supply of Cannabis in the local market. Previously, Aurora Cannabis acquired 51% stake in Portugal’s Gaia Pharma, but with the construction of a new Cannabis cultivation facility in Germany, it will be way ahead of any potential competition in the future. Since forming a bullish daily bar on December 24, 2018, the stock of Aurora Cannabis has remained highly bullish. Over the last five months, it has climbed up to $10.32 per share, representing a 125.33 percent increase in market capitalization. However, since March 19, the stock mostly remained range bound and went down the test the long-term downtrend line. In the last few days, it seems to be gaining bullish traction and currently, approaching the major psychological resistance level near $9.30 per share. With the latest approval to market 4,000 kilograms of medical marijuana in Germany, Aurora Cannabis has secured a strong foothold in the lucrative European Cannabis market. 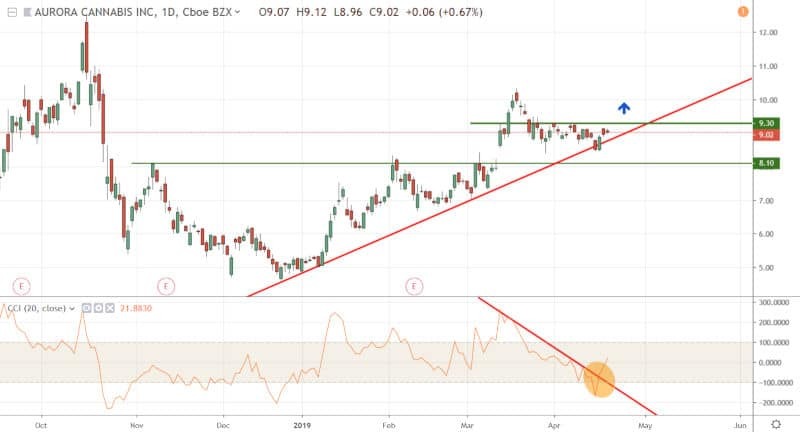 Moreover, given the Commodity Channel Index (CCI) has already broken above the downtrend line and produced a buy signal, there is a strong possibility that the stock will remain bullish in the coming week. If we see Aurora Cannabis’ shares breaking above the $9.30 per share mark, it might gain ample bullish momentum to test the next resistance, which is located near the $10.30 per share level. The post Aurora Cannabis Receives Permit to Grow Medical Marijuana in Germany appeared first on CryptoPotato. The post New Assets Management Dimension: VIP Services For Big Crypto Investors appeared first on CryptoPotato. Canopy Growth’s stock looks bullish in the pre-market, raising around 7%, after reaching a 10% high on the after-hours trade on Wednesday. Investors turned bullish on the weed giant following the news that it has almost finalized a deal to buy the medical marijuana company Acreage Holdings if pot becomes legal in the United States. The two companies were discussing the deal for a few weeks. However, sources close to the acquisition offer by Canopy Growth said both parties have agreed on 98 percent of the terms and only need to agree on the final price. While Canopy Growth can buy Acreage Holdings right now, the problem is its stock is listed on the Toronto Stock Exchange (TSX) and cross-listed in the United States. Since Marijuana is still not legal at the Federal level in the U.S., the acquisition of Acreage Holdings will be illegal under TSX rules. Hence, Canopy Growth’s stock could be delisted in TSX and the U.S. if they outright make the acquisition right now. The talks between the two companies are actually revolving around Canopy Growth’s “right” to buy Acreage Holdings if Cannabis is made legal by the Federal Government of the United States in the future at an agreed-upon price. However, once the deal is made, it will give Canopy Growth the right to all the products of Acreage Holdings. Depending on the terms of the acquisition agreement, Canopy Growth can also start helping Acreage Holdings to grow by lending some of its intellectual property and branding rights. A number of such deals have been done in the past between Canadian and U.S. companies to avoid legal issues. In fact, Canopy Growth has made similar deals with Slang Worldwide Inc via its investment subsidiary Canopy Rivers Inc.
Canopy Growth’s stock reached as high as $47.35 per share for its U.S. listed securities on Wednesday. But as the day progressed, it gradually retraced back to $45.60 per share by 8 p.m. during after-hours trading and settled with a 6.42% gain. Investors are waiting for the U.S. markets to open in a couple of hours and there is a good possibility that the stock will turn bullish once active trading commences on Thursday. Since Canopy Growth’s share price has already broken above the daily downtrend and made all the way up to $47.35 on Wednesday, the next major resistance to the bullishness should come near $47.95 per share level. 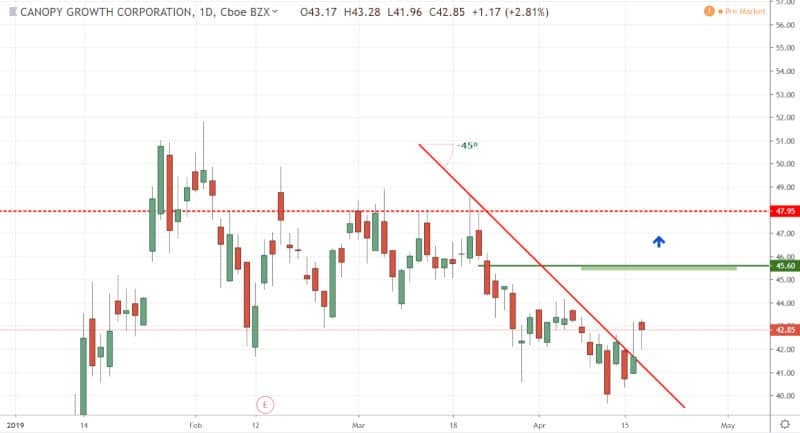 Since February 2019, the resistance zone near $47.95 kept the stock price from gaining further bullish momentum. Hence, if we see a clean break above it on Thursday, it will open up the price target towards $50.00 to $51.00 per share by the end of this week. The post Cannabis’ Canopy Growth (CGC) Shares Surges 7% Following Right to Acquire Acreage appeared first on CryptoPotato. 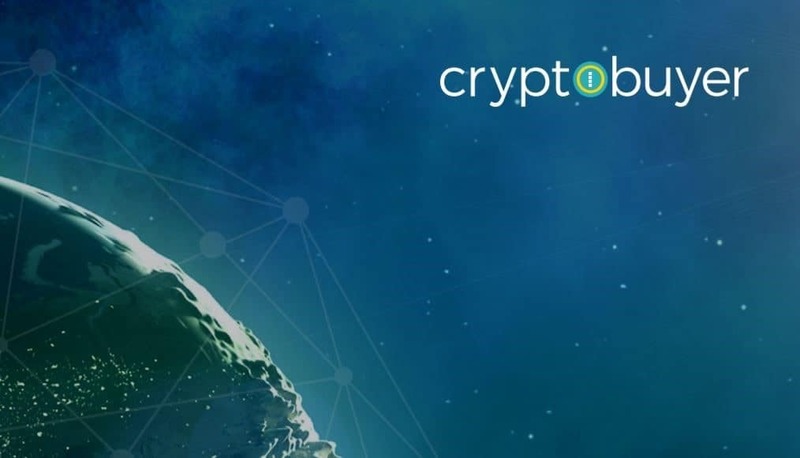 Cryptobuyer is a leading crypto asset company which facilitates the integration of digital currencies in your everyday life by enabling the exchange of digital currencies, digital payments, BitATM franchises, and BTM multi-asset machine solutions without the need to go through a third party financial institution. 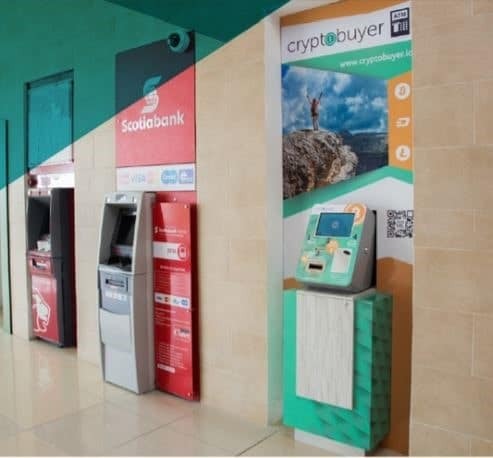 Moreover, Cryptobuyer was the very first company in the world to install a Crypto ATM with integrations of Dash, Litecoin, and Bitcoin, in a commercial bank partnership in Latin America. It’s also the very first fully compliant platform to operate in the region properly. Cryptobuyer is having its Initial Exchange Offering (IEO) set for April 23rd on the popular Coineal exchange. The event will have 150,000,000 XPT tokens allocated for $0.01 each, and it will go through two phases – a presale and a public sale. Cryptobuyer was founded in 2015, and it proudly boasts a team with international and entrepreneurial expertise in the blockchain space. The project’s goal is to spread the reach of cryptocurrencies by effectively integrating them within products of people’s daily lives, as well as services so that more users can benefit from the advantages of digital currencies. BTMs: The Bitcoin Teller Machine (BTM) network of Cryptobuyer takes advantage of industry-leading hardware of supreme quality and resilience. It also offers an open-source software which could be modified to meet the specific needs of the customer and user.The BTMs are compatible with a lot of different digital currencies, while other existing currencies can be easily integrated. Point of Sales (POS): The POS solution works with a technology that reads QR codes, and it’s currently the most accessible technology for any kind of device. The POS solution offers a very convenient system which automatically converts cryptocurrency payments to fiat currencies, eliminating the friction when it comes to adoption for merchants. Web Platform: Cryptobuyer’s web platform includes features that are designed to appeal to users of online platforms. These include fast KYC, security hosted by leading industry companies, multiple cash-in and cash-out options, simple registration, and so far. It has also integrated a utility bill payment service solution such as mobile phone top-ups spread across 180 countries with more than 600 operators. Mobile App: The mobile app of Cryptobuyer is intended to fit all of the solutions in one place and provide a simple and easy-to-use interface. It’s compatible with Android and iOS devices, and it guarantees broad access in emerging countries. The overall strategy of Cryptobuer is to provide merchants with a better way to buy and sell digital currencies by expanding its international network of BTMs to markets where the demand is high. The stage is set for adoption. The Argentine Central Bank has requested for the private installation of ATMs to address the increasing deficit. Currently, Cryptobuyer has a partnership with the manufacturer of ATMs who are building hybrid ATMs. They can be interconnected with banks and have a functionality to buy and to sell digital currencies. Mexico, on the other hand, is the largest remittance market in the world. There are only five cryptocurrency ATMs in Mexico City. Venezuela is also presenting massive opportunities because of hyperinflation. Cryptobuyer has already made serious advances, partnering up with supermarket chains, as well as convenience stores, even including marquee names such as 7-Eleven. Cryptobuyer is issuing an ERC-20 token which is ticked XPT. It will allow token holders to claim a share of the gross revenue (fees) which are generated by all of the products of Cryptobuyer. The token represents a share in the success of the company, as well as of its business model. The reward will be distributed through a secondary token which is called CBPT – short for Cryptobuyer Profit Token. It will be pegged to the USD one to one. On the other hand, everything you need to know about the tokenomics is in the table below. Cryptoubuyer will take advantage of the relatively new fundraising model called Initial Exchange Offering (IEO). It will take place on cryptocurrency exchange Coineal.com on April 23rd at 15:00 UTC. The IEO will be consisted of two sessions and will allocate a total of 150 000 000 XPT tokens, each valued at USD 0.01. Once the sale is completed, the XPT token is going to be listed and included in Coineal. As mentioned, Cryptobuyer boasts a team of internationally renowned experts in the field of blockchain and entrepreneurship. Here are some of the team members and advisors. Jorge Farias – as the CEO of Cryptobuyer, Farias has more than ten years of experience in the field of digital commerce. He has also been a country manager for Bitpagos (currently Ripio) in Venezuela and as a country manager of cloud money solution AirTM in Venezuela and Argentina. Ruben Colina – he is the CTO of the company and is an experienced systems engineer. With more than a decade of experience in the development and the implementation of complex software projects for both private and public organizations. Angel Graterol – Angel is a system engineer with additional proficiency in IT, design, and management of information systems, systems security, and DevOps with more than eight years of experience. He’s the CIO of the company. Randy Hilarski – he is a popular cryptocurrency influencer and an expert in global relationships. He’s worked on projects such as Zencash, Superior Coin, Steem, Arcade City, and much more. Pablo Lopez – Pablo is the CEO at Creativigo Consultores de Innovacion. He is an experienced professional who executes projects of organizational innovation and designs products and services in the field. Ivan Novosiolov – Ivan is a renowned marketing expert with more than ten years of experience. He has managed to create, implement, and execute several marketing and advertising campaigns, including agitation and election campaign management in the US highlights. In addition, Cryptobuyer has managed to raise an undisclosed amount from the South African venture capital firm Invictus Capital. They are also backed by the Applicature.com firm for the development and the audit of the smart contracts and the platforms. Cryptobuyer does seem to have it all figured out. It has targeted a market which has already displayed a demand for cryptocurrencies, while also lacking the necessary infrastructure for their proper integration. Of course, there are also challenges ahead. If you want to stay constantly updated with any news and updates coming from Cryptobuyer, you can follow them on Twitter, Facebook, and Instagram. The post CryptoBuyer- Meet the Company Which Created the First Crypto ATM in Latin America appeared first on CryptoPotato. Binance Coin (BNB) has finally broken above the elusive $20 resistance level in early today’s trading after rising by 6% over the past 24 hours. The coin is currently trading around a price of $20.70 after the cryptocurrency has seen a 30% monthly price surge. Within the top 10 ranked projects by market-cap, Binance Coin remains the most serious performer over the past 90 days, after rising by an extraordinary 217%. The coin is now 20% from its all-time high at $25. Since our previous BNB/USD price analysis, we can see that BNB/USD has managed to break above the resistance at $19.89 – $20 where lies a 1.414 Fibonacci Extension level. From above: The nearest level of resistance now lies at $21.00. Further resistance then lies at $22.13, along with a 1.618 Fibonacci Extension level. If the buyers continue above $23.00 and $24.00, we can then assume more resistance above at $24.42 followed by higher resistance at the previous ATH at $25.18. From below: The closest support now lies between $20.00 and $19.89. Below lies $19.00, $18.33, $17.30 and $16.27. The trading volume is close to the average level, not significant at this time. The RSI has recently bounced back above the 50 levels as the bulls remain in control of the market momentum. The Stochastic RSI had also recently initiated a crossover above which had signaled that BNB might break the $20 resistance level. 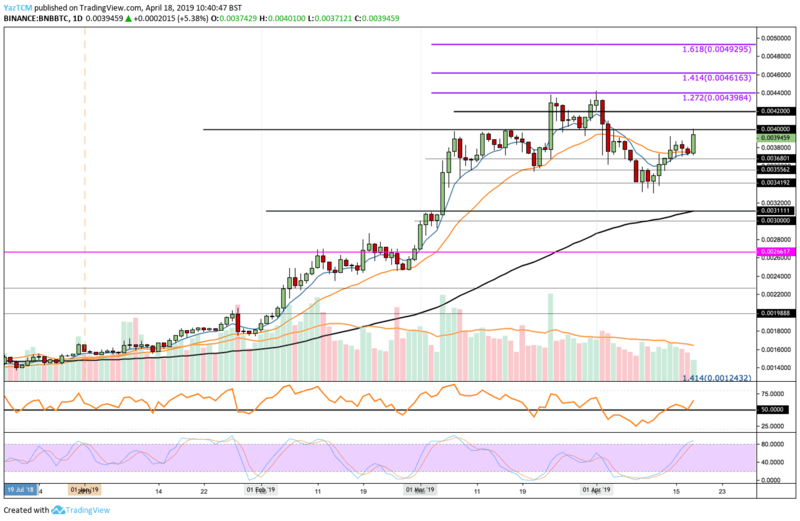 Following our previous analysis, we can see that BNB/BTC has continued to climb higher and has recently reached the resistance at the 0.004 BTC level. From above: The nearest level of resistance now lies at 0.0042 BTC which is closely followed with further resistance at 0.0044 BTC (the Bitcoin’s all-time high). Above 0.0044 BTC, higher resistance lies at 0.0046 BTC (1.414 Fib Extension) and 0.004930 – 0.005 BTC (1.618 Fib Extension). From below: Initial support lies at 0.003680 BTC. Support below this is located at 0.003420 BTC and then at 0.003111 BTC which is further bolstered by the 100-days moving average line. The Stochastic RSI looks to be positioned to initiate a crossover below signal which could stall BNB/BTC progress. However, the RSI has recently bounced back above 50 which indicate that the bulls have regained momentum. The post BNB Surpassed $20, The Highest Price Since January 2018: Binance Coin Price Analysis April 18 appeared first on CryptoPotato. Popular cryptocurrency exchange BitMEX, characteristic with its high leveraged trading, has partnered up with Chicago-based Trading Technologies (TT) in an effort to bring cryptocurrency trading to professional traders. The most popular cryptocurrency margin exchange, BitMEX, has recently announced a partnership with the Chicago-based firm Trading Technologies. The latter offers a comprehensive platform to trade derivatives, as well as equities and cryptocurrencies to their professional traders. According to the announcement, the partnership will allow Trading Technologies (TT) users who are eligible to trade at BitMEX to gain access to all of the products that BitMEX exchange offers, including the most popular one – the XBTUSD Perpetual Swap. The perpetual swap is a derivative product which is fairly similar to a traditional futures contract. However, it doesn’t have an expiry or settlement date. Moreover, it’s designed to mimic a margin-based spot market and it trades to an underlying reference Index Price. As noted, the platform of Trading Technologies already provides traders with the ability to trade Bitcoin futures contracts on US-based exchanges which include CME and CBOE. it also offers cryptocurrencies which are supported on Coinbase. Perpetual swaps, on the other hand, represent a unique product in the crypto derivative space, which will now allow professional traders to synthetically trade the underlying cryptocurrency asset. According to the CEO of Trading Technologies, Rick Lane, the move is expected to grow the trading volume on BitMEX, which is already the highest by means of Bitcoin trading, as it will not only bring existing TT clients who seek exposure to crypto assets, but it will also bring new users who are looking to leverage professional trading software. The post BitMEX Is Growing: Partners Up With Chicago-Based Trading Technologies (TT) appeared first on CryptoPotato. Looking at the daily chart, we can see the sideways movement over this time: from above there is the $5300 boundary, whereas from below is the $5000 boundary. Since yesterday we can see Bitcoin making its way up, slowly toward the $5300 again, for the third time in the past 12 days. However, there are two options: The bullish one is, of course, breaking up (and holding it). The bearish scenario is completing a sort of head and shoulders pattern (now it is the right shoulder) with lower targets around $4500 – $4600. From below, the closest support level is the $5200, with some support coming from the 4-hour chart 50-days moving average line at $5150. Below lies the strong $5000 support level. Breaking down the last could target Bitcoin to retest prior support at $4800 and $4700. Further below is the 200-days moving average line (1-day chart) which is currently around $4500. From above, the closest significant resistance is the $5300 – $5350 area. In the case of a break-up, the next target is the $5500 level before getting to the 2018 support turned resistance line at $5700. – Daily chart’s RSI: Stochastic RSI oscillator of the daily chart had recently made a cross-over in the oversold area. This supports the option of a break-up of $5300. Besides, the RSI had broken up a descending trend-line, and now aiming at the 70 RSI level. – The daily trading volume: In my opinion, the volume lacks, as the past few days carried low volume (and low volatility). In the case of a breakup, BTC will seek for higher amount of trading volume. – BitFinex open short positions: the open short positions, had slightly increased to 19.5K BTC of open positions. 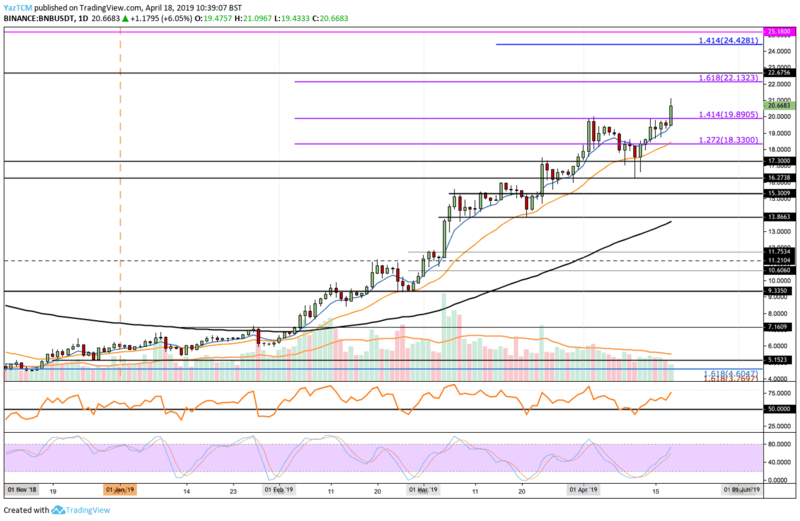 The post Bitcoin Price Analysis April 18: BTC Is Facing $5300 For The Third Time – What’s Coming Up Next? appeared first on CryptoPotato. https://dailybitcoinreport.com/wp-content/uploads/2017/09/bitcoin-300x59.png 0 0 Crypto Potato https://dailybitcoinreport.com/wp-content/uploads/2017/09/bitcoin-300x59.png Crypto Potato2019-04-18 07:52:392019-04-18 07:52:39Bitcoin Price Analysis April 18: BTC Is Facing $5300 For The Third Time – What’s Coming Up Next?